Vinyl banners are perhaps the most common banner in use today. They’re called vinyl banners because they’re made from poly vinyl chloride, and Banners Perth uses this material because it’s strong, light weight and very durable outside. Our vinyl banners have a dense weave throughout, giving inherent strength, and when you combine that with tough ropes and reinforced eyelets, you can be sure your banners are going to last the distance. Particularly critical is the way the banners have been printed. Using solvent-based inks gives you UV stability, outdoor durability and colour consistency – these three attributes cannot be matched by any other printing technology. Banners are a crucial part of any business’s advertising strategy, so we at Banners Perth strive to ensure we cover these three aspects in the best possible way. We’re sure that if you buy your banners through Banners Perth, you’ll be pleasantly surprised with your banners and that you’ll come back for more. Visit our contact page to ask us about your banner needs. 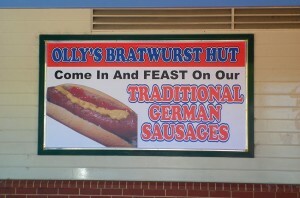 This entry was posted in Vinyl Banners and tagged Sailtrack Banners, Vinyl Banners by Banners Perth Staff. Bookmark the permalink.